Another warm front passing through Dixon Entrance, gales from the Southwest, some rain, but very fishable! 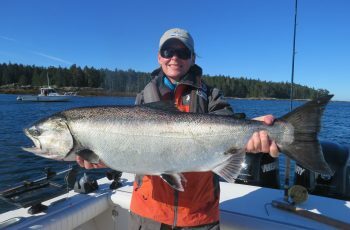 Most of our guests are one chinook shy of a four king limit with a day to go on our current trip. 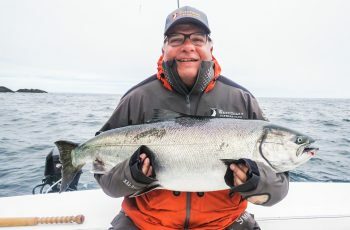 Yesterdays fishing was fantastic for some of us…I took my group over to the REEF with Korey, and we hammered the tar out of em for most of the afternoon. Peaceful fishing in flat calm conditions, no kelp, zero boats, and a Marchand reef choked with diving ducks and gulls. The bait was stacked in there, I am guessing 50 tonne in the sweet spot. I was grabbing a king every pass, ending up with a limit for three guests, a 29, 26, 24, 23, 21, and an 18. 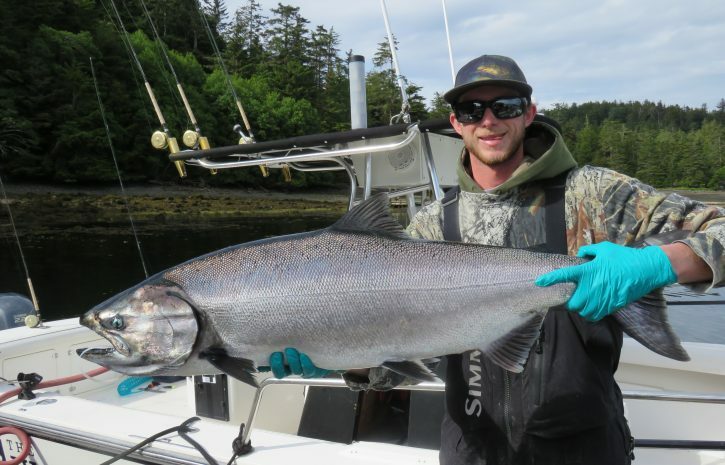 For once Korey’s boat had smaller kings, averaging 18 to 20, but they hit a swack of em for sure. They had a limit of coho as well! 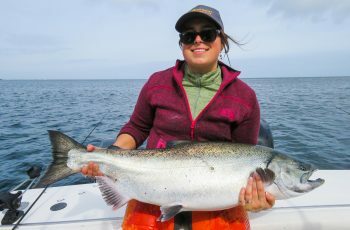 The rest of the guides hit the EAST SIDE and grabbed limits of mid teens, one boat had the biggie at 33 lbs. Jordie has had a couple good days in here numbers wise, wanted me to pass that along. 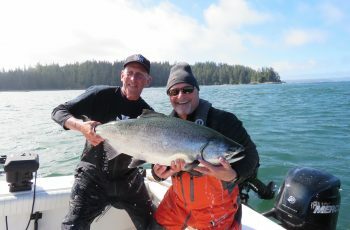 Today saw three tyee, the largest was released at 37 lbs up at Rat Bay, Bryce providing the guiding. Yes, Mcpherson Point is alive again. The sea lions appear to have moved off, that is a party worthy event right there. 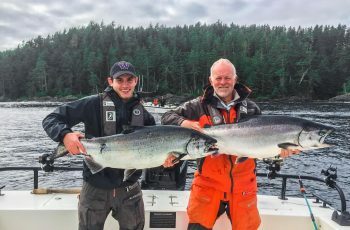 Chutter snuck a 34 into his punt, a nice tyee for sure, same location. We dropped a line this pm in there and grabbed two nice mid twenties in short order, before heading back to the reef. There are humpbacks everywhere feeding on needlefish and herring. Please be careful out there, give the whales some room. The Reef was slower today but we hit a monster and broke it off. As frustrating as that is we regrouped and grabbed a couple low twenties, the area still plugged with bait. The winds are picking up tonight and the southerly breeze is now building to a gale. Time to bolt everything down in the wheelhouse, she is going to rock and roll tomorrow out on the chuck. Tomorrow should be fishable so standby for a fishing report tomorrow night, time to get some rest.